They are dependent on us just as we are dependent on them.. Assist them in finding home when lost or homeless..
Retrieving souls when souls have wandered away..
Be with them in the time of Crossing to Elsewhere.. While considering how best to focus on this topic, I had a series of conversations with Dan Jordinelli. Over the years, Dan has sponsored my workshops down in the Los Angeles area and, in addition, he is dedicated to helping animals in a variety of ways. We decided to offer a workshop in the Los Angeles area and Dan arranged for this workshop to take place in the East Valley Animal Shelter during the weekend of October 4  5 2008. The decision to devote a section of our website, Shamanic Visions, grew out of this weekend. The first section describes our work during the weekend and is followed by responses from participants sharing their experiences with the animals and of the Shelter itself. 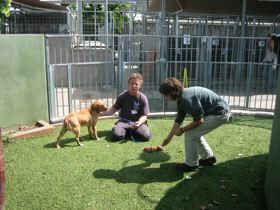 First, to share a Circle’s experience in doing shamanic work within an Animal Shelter. Third, to encourage any of you visiting this page, to send in YOUR experiences with our Animal Companions -- especially any shamanic work you may have done with one, or more, of them. This can include any organizations with which you have worked that have this healing focus. The Animals are sending us their Voices; they are calling for our help. They seek for us to know they have souls too and that their spirits need to be touched by loving human hands and hearts. One way we can do this ‘touching’ is to share among ourselves, and with the wider public, the service that we do in this area. By sharing through the internet, we can touch beyond our immediate group of friends, circles or shamanic organizations. Another way is to do some work in your community that serves our animal companions. My hope is that these webpages encourage those that might be unsure how to do this and that all of us will share what we are doing. First we gathered in a community room at the Shelter and gathered our Helping Spirits and the power of the Circle itself through quiet drumming, rattling, and singing. While doing this, we were aware that there were webs or threads stretching from our Circle and moving through the whole shelter. Thus we attended to doing the kind of drumming, rattling, and singing that was quiet, inviting, and filled with the heartbeat of our love for these animals. 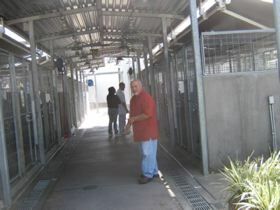 One, to be Walking Prayers within the shelter as we moved among the cages and various housing for the animals there. By walking prayerfully, we intended to spread comfort, blessing, compassion, and healing. We wanted the animals to know we walked with love for them. We did ourselves as Walking Prayers frequently during the days there. Two, we sought to see which animals, in particular, wished to connect with individual ones of us. When we felt the call from one of the animals, then we spent time at their cage learning what they wished to share with us and what kind of shamanic healing they were seeking. The animals shared a range of issues with us including how they wished to be called (name); how they came to be at the shelter; what their fears were, and just how they were hurting. Three, to deepen our healing work with them, we then asked the staff to let us work with these animals outside their cages in an area where we could touch, be touched, and do special shamanic healing. This involved doing soul retrieval, extraction of toxic energies, restoring of power, and crystal work. While worki ng in the shelter, we had written down the names and shelter numbers of the various animals with whom each of us had interacted. During our last afternoon, we created a string of prayer beads that we could use beyond our time at the shelter to focus on the animals we had met there as well as making prayer for all our Animal Kindred. We have continued to keep in touch with each other and to share any news we receive of the Shelter and of the animals there. Different ones of us are using the interest to post photos and descriptions of the animals with whom we worked and who are still seeking homes. We want to about the adoptions done by members in our Circle for all of us now ‘know’ these particular dogs! The following are letters we received from participants in the “Animal Companions: Our Kindred Spirits” workshop at the shelter. Some of the letters are responses to the workshop as a whole while other letters express concern about specific animals with whom an individual did healing work. My experience this weekend at the 'Kindred Spirits' workshop was one of personal journey and of the ways a group effort could come to bring light, comfort and hope to the animals. 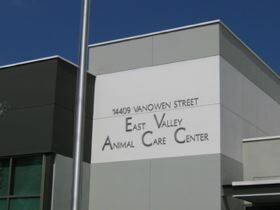 It keeps unfolding and revealing the magnitude and avenues that were opened and established that weekend at the East Valley Animal Shelter. We gathered on October 4th and 5th in 2008. The animals were waiting with curiosity. They waited with all the heaviness they had accumulated up to that point that got them where they were: a place of transition, a shelter. In the end the animals needed to be reminded of the blessing that a shelter can be. They were fed, looked after and had a roof over their heads. They had possibilities. Possibilities of finding a new owner, a new life and also of returning to where there had come from and to people who love them and missed them. This seems large at first to digest for them as they were in modes of distrust, anger, confusion and complete unbalance. Nerves are a fragile thing. Most were affected by the stress that went with the territory of being in a shelter. Our circle helped to calm those nerves. The dogs were emotionally available; they had a raw guttural availability to their feelings. The cats were different: they had a thicker wall between them and us when it came to opening up emotionally. We knew we had succeeded on some level as the second day there was very different energy than we found the first. It was calmer and there seemed more patience.
" I live in a world of legalized bullies, I'm so very tired”. Day two for these two females was a total turnaround. No alpha no omega - just two dogs at ease with each other. The larger female never show any need for aggression. I made sure they got equal attention. Underdog was feeling much more safe. The other animal that touch my heart was an Alaskan Malamute with no name. His ID was A0985064 and he had DM50 written on his stats. So I named him Dismo. Not so much for the dismal state I found him in but because of his eyes which looked like disco balls. He was in a state of bewilderment of why I'm I’m here and where are my people. He was eleven days into this part of his journey. 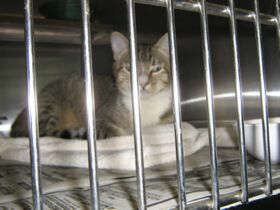 He had a possible owner as he had a chain collar with no info. His most pressing message was "touch me". He longed to be petted and rubbed. His summer coat was shedding and was all matted giving him an unkempt look. He knew he looked haggard but it wasn't what he felt. He was still proud and strong just confused with the particulars of where he was and how he got there. Late the first day he pooped near the front of the gated area. This had him conveying a strong sense of shame as he had to avoid walking and sitting in it. He chose not to look at me but wanted to be near as close to me as he could. I understood. I kept reinforcing that he was worthy, deserving, completely lovable and that he mattered. My greatest tool was a giving of hope that this was all temporary: that he would be united with love whether they were his old owners or new ones. That it would all work out. He seem less confused after that first day. He was much more at ease the second day. I sat and read to him and he rested. Early we got to pull a few dogs out to work and journey with them. Dismo was one of them. Something tall is what came through. Be it mountains, trees or a giraffe power animal, something tall was part of his picture. ‘You will be fine I’ reassured him. His old matted fur came out by the droves when touched or petted. “I'll be back with a brush,” I let him know. Looks were important to him and he wanted to put on his best coat when being viewed. He and I are lucky that I'm local and can visit again. He had hope and that's a powerful thing to leave anybody. There must have been a lot of hub hub that night because the second day we were there the general energy of all the dogs had changed. Oh some were still pissed and could not see straight; some still had their anger issues but something had changed. Some sense of calm had come over the shelter- maybe a sense of hope. They knew who we were. We were the ones who gave attention and brought light. We walked by with our rattles. We were some sense of light in a environment that was difficult and confusing at best for them. What i did notice the second day was that some of the dogs were resentful of attention paid to other dogs. I shared this with the group and when we went back to do a walk around we were mindful to spread out and give a nod to all the dogs and cats. I learned a lot this weekend. I came back with a different connection to my critter companions. A clearer connection. I learned the cats were not so easy to relate to. They had issues too and weren't so fast to change their mood. The air was heavy in the cat room and I was not able to work in it as I though I could. I realize that this was a group shelter ...... a group home if you will. There were chickens, hens, water turtles and rabbits and these were just the visible ones. I came to the shelter thinking it was more about the ones about to be euthanized and that we would be working with animals about to make that big transition. It wasn't. It was more that this was about a safe place to find their next move whether it was reuniting with lost owners or finding new folks that wanted them. This was about a small group of us connecting our open hearts to that of the hearts of the animals and bringing a sense of hope and love. That was enough to make a big difference. The critters were so ready to receive. It was a win-win. Before I sleep each night I envision a white column of light circulating down around up and down again over the shelter. I know with all the emotional heaviness and turmoil that comes to the shelter it is ultimately a place of light - of healing light. The shelter is a blessing in the community. and if any one feels drawn to a very lovable Alaskan Malamute his name is Dismo or Malibu Ken if you will. His ID is A0985064. I was truly blessed to be a part of this gathering. It brought me new insights and areas of possibilities. We have relationship with these Kindred Spirits and it’s easy to see what we bring to their lives. On the flip side of the coin a large part of they're being, is to be here for us. They are here to take care of us in ways not as visible - the word Companion goes both ways. Yes, the animals at East Valley Shelter, and memories of the time we spent together working with them, stay with me night and day. I am very glad to have participated in the workshop. I have been thinking especially of dear 3-year-old Lola, a sweet, reticent, sight-hound type (identified by the shelter as “German Shepherd”). 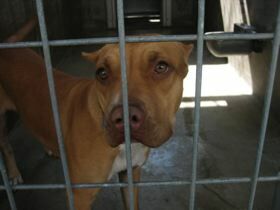 Lola is # A0984033 at <http://www.laanimalservices.com/animalidsearch.htm>. After our small group worked with her, you could see her open up more to people. But even though she has a warm and sweet disposition, she seems by nature to be a less aggressively-snuggly type, which may work against her adoption. 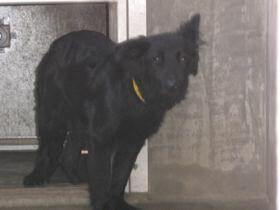 Her kennel card says she was “owner surrendered.” Lola may not understand that she’s been dumped, and may be waiting for her prior owner to come back to her. But she’s been at the shelter since 19 September, and time is flying, especially since she has no microchip, which would have given her a longer period of grace. I imagine she can’t afford to wait much longer. Please hold her in your prayers. Thank you all, so much, for being with the animals and doing this work with them. Being in circle with you all was a wonderful experience. I will be writing more of my thoughts for the website. 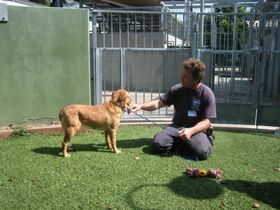 I also wanted you all to know that Ginger, whom I believe some of us worked with, was rescued by a rescue group. 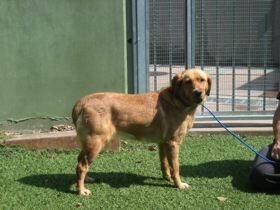 Unfortunately, Blossom, her friend, is still there, and has been redlisted, but I have been networking her, along with several of the others, and have hope for her that she will also be adopted. …and in a follow-up emails from Tina.. Yes, I will certainly take a soft rattle. And I am hoping we can bathe Dismo - I wish we could bathe them all, but we will only be bathing those who will be taken to the adoption, and I don't know who those are yet. But the rest I will certainly walk among them and rattle and pray. 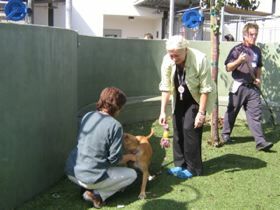 I am grateful for the time I spent with you and our animal kin at the shelter and delighted to hear of Ginger's rescue. I see that Lilly, the Tibetan Terrier my group worked with is still in the shelter and not yet put up for adoption. Thank you for all your blessings of the animals and the shelter. 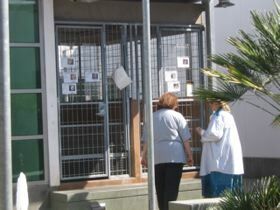 In the history of LA Animal Services we have never had a blessing of the animals at our shelters. This particular shelter really needed a blessing as a whole. Thank you! I'm happy staff was kind and accommodating to the Circle. Bless you for spending time with our animals and blessing them with all your heart, soul and spirit! Hi Everyone....I've been really holding all our dear friends at the shelter in my hearts this weekend, as these are the most possible days for adoption. I want to put out the word about Lola...Elizabeth wrote about her yesterday and she's been specially in my heart too. If she does not get adopted this weekend, I will promise to foster her if someone can find a way to get her up here to San Jose. I just can't let her go, and because she is so quiet and sweet, I think she could get overlooked. So, if anyone has any plans to drive this way, or knows of another way to get her here, lets make it work. I had a strange dream the other night in which Apple was giving away free IPODS as a promotion. When you picked out the IPOD you wanted, it came with a puppy or dog tied on like a bow (it worked in dream land). As I keep reflecting on this dream, I know that the free IPOD attracted more attention than the possibility of adopting an animal. I don't ever want to forget for me that the heartbeat should come before the on/off beep. So, help me hold Lola in prayer and/or help me figure out how to bring her north....I can't get down there again right now as I have responsibility for my brothers business while he is on vacation. I could come down after October 25, but not until then. And I forgot to say, tomorrow, Saturday, I will be going to the shelter to bathe dogs for the Best Friends Super Adoption Festival on Sunday, so I will be able to check in on them in OR. And it is a great blessing to have the energy of the circle to take with me. It gives me deep joy to hear how different ones of you are following animals with which you connected..obviously in special ways for them and for you (for us!). Susan and I were on the phone earlier today as she was checking both about Lola and Sami...both of whom are still at the shelter. Susan had made such a connection with Lola and I with Sami. As with each of you who wrote about your relationships there, I, too, find myself making special prayer that Sami find someone..and someone find Sami! 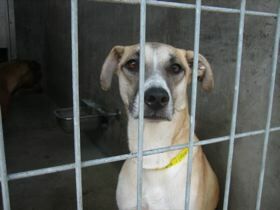 I do so wish that I were in a situation here at home where I could 'foster' Sami until such a home is found. The most fostering I can do just now is to 'foster' her through prayer and speaking of her at our webpage...speaking of her and all those who are there...and will be coming there to the Shelter in the future. Remember they told us that SATURDAY was the most active day, at the shelter, in terms of adoptions...so perhaps tomorow some of them will be leaving for a new home....or even their prior owners will be finding them!! I recommend we each use our prayer beads to focus on this weekend at the Shelter -- especially on Saturday---and make prayer for the staff at the shelter as they are important intermediaries in the adoption process. I think these creatures are using us to 'give voice' to their desires....may we continue to Voice on behalf of them.. I've changed my email address but would love to hear about the things everyone is doing. I'm not able to join you physically due to distance but I can certainly continue prayer support. What a generous group! I also thank you for the update on Ginger and Blossom. I have been praying for them daily and also checking the website to see whether they are still there. On Thursday I saw that Ginger's picture was gone and moved into walking-worry/walking-sad at Blossom and her being separated. I hoped that they would find home together, whether in this world or another. I've also been using my bead string to bring myself back to walking-prayer. who dedicate themselves to their care. Thank you all for the blessings of circle. I would appreciate it if you continue to keep us updated! I have Lily's ID number and will keep an eye on her. She was brought in as a stray on 10/4, so if her people don't come for her I will put out a plea on her behalf to my rescue network as soon as she is available for adoption. By the way, I don't think she is actually a Tibetan Terrier. I'm not sure why they have her down as one. She's probably more of a poodle mix. My late Lucy was a TT and she looked nothing like that. 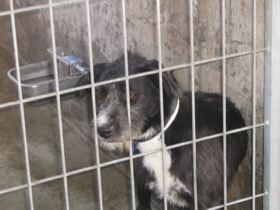 I am so glad to see all the e-mails, plans to bathe the animals, follow up on adoptions. Our Circle spirit lives on in a strong way in the Shelter. As we approached the Los Angeles East Valley Animal Shelter I noticed the beautiful landscaping around the building, and this surprised me as the Shelter was in the middle of a city. Two large windows were painted with transparent paint; one had a playful puppy the other had a cat sitting, looking up at something. We entered a large room with a desk, benches and a few cages with kittens in them. Lots of volunteers were about. Eighteen of us formed a Circle in the conference room of the Shelter on Saturday morning: We drummed, rattled, sang and journeyed to find out what Spirit wishes to work with us this weekend. Carol reminded us to “walk with gratitude…thank you, thank you…… and blessing the animals” as we stopped at each cage, one at a time. We were to be “walking prayers” this weekend. The cages were clean and roomy for the dogs. 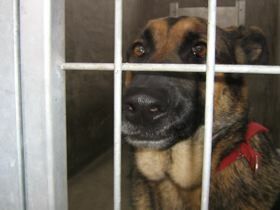 The dogs were separated from each other by concrete wall. Some cages had several non-aggressive dogs together. All this was outdoors under a roof so there was plenty of fresh air. Fine water mist was released into each enclosure when the temperature climbed and the concrete was heated with embedded pipes of hot water circulating in the sleeping quarters when the nights are cold. 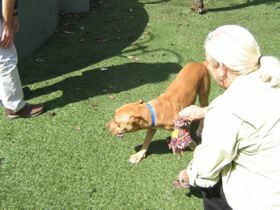 There was a grassy area to take a dog out and observe him by prospective adopters. A fountain, surrounded by plants in front of the cages added a pleasant sight and sound to this outdoor setting. The cats had a separate room away from the barking dogs. They were in clean small cages. I had a feeling that they felt safe there, as cats like small, cozy places. As I slowly made my way past the cages, I stopped in the corner where the most aggressive dogs were housed. I was drawn to an enclosure of a large pit bull, named Blue. He stood in the middle of his run with his legs apart and loudly barked and growled. I saw that his chest muscles were powerful and that his ears were either cut or chewed up to small knobs. I received an image of him at one time being loved and happy. Then treated with roughness and teased and used to fight other dogs. I sat down in front of his cage door. I called upon the Spirit Helper that had come to me in this morning’s journey to come and help me now: It was the male Swan that brings his family to our lake shore back home to feast on dried corn. He now reminded me what I do when he (the male swan) gets too aggressive (if I am not feeding him and his family quick enough) I make a shhsshhh sound and mentally ask him to calm down. So, now I made the same sound in front of Blue, sent him peaceful scene of a sunny meadow and golden rays of love emanating from my heart center. He now sat down and barked some, not quite as loud as before. Then his eyes seemed to soften and he lied down and continued barking, now even less and kept looking at me. I kept sending him love and what seemed like after a long time he came right to the gate, stuck his nose and mouth through the slit in the gate. He first seemed to mouth silently, and then managed to produce a puppy-like squeaky sound. Now he also put his paws on the slits and kept on whining. The next time I visited Blue he again barked at me loudly at first, then came by the gate and briefly showed me his belly then turned on his side leaning against the gate. I thought perhaps he likes me to touch him, so I lightly stroked his fur. 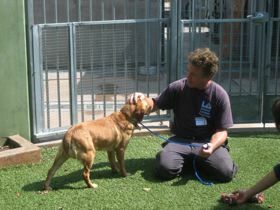 He immediately jumped up, backed away from the gate and began barking and growling as he had done at the first visit. Blue would keep up this barking and growling, yet his tail was wagging. I was amazed how fast his behavior changed and how unpredictable he was. My guess is that he will not be adopted but when the space is needed he will be put down. Then his soul will be at rest, all fear will be gone and he, in another, spirit form can run free and be happy again. Was there soul loss? When and where did the soul loss occur? Do they need soul retrieval? Was there loss of power? Do they need a Power Animal brought back? We found out that our little mixed breed puppy just missed a little girl who had played with him. He also wished to run as he was very energetic. We ran him in the room around the circle of chairs. He seemed so happy to be able to run. He also managed to “mark” three paper bags that sat by the chairs, as his territory. Happy ending to this puppy was that Sunday a man came and wished to adopt him. 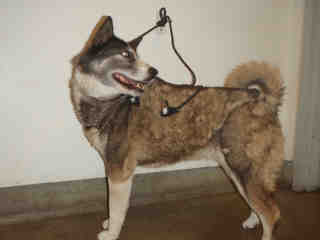 He had at his home, a similar mixed breed, an older dog. 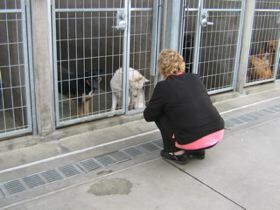 We made contact with many other dogs, by stopping at their cages and sending them Love. What did I learn from this experience? I learned acceptance of the animal’s circumstance. These dogs were in the best place for them at this time: They were not abused, they had shelter, they had food and medical care and for some of them a good and loving home was in their future. That was all of their hope. We also journeyed to see the guardian Spirit of the Shelter: I saw him as a large gray wolf/man with fur hanging in long sheets; he had a face and hands of an old man. He said that when it gets dark he silently moves among the cages, comforting the animals and when it is time to cross over, he appears to the animal helping their soul to move to the best possible place for them. I also learned that the animals offer us humans a bridge to Divine, so blessed I felt. This is an unconditional gift of love I received. Sunday, my last night in L.A. I spent in Dan’s house and around 2 in the morning I was gifted with a clear, plaintive song of a coyote. He seemed very close to the house. It had been very many years since I last heard his song. So here was the ancestor of the dogs confirming to me that the animals do bless us. 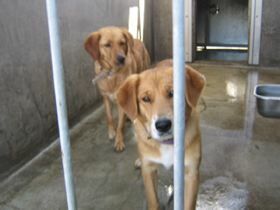 Workshop in California, L.A.East Valley Animal Shelter. I have enjoyed seeing the ongoing saga of Lola as an animal ‘adopted’ by one in our Circle in order to ensure that Lola is rescued until she can be taken North to another member of our Circle who adopted her!! I just learned that they were both taken by the same rescue, but are going to separate foster homes. Apparently they have been renamed Ginnie and Winnie (personally I liked the name Blossom better, but oh, well. Ginnie can be short for Ginger). They promised they would keep me updated. This is an incredible group, and so good that you are right in the center of it all. have a loving home. Good for them. This news fills my heart. the same rescue place is going to keep tabs on both of them and that we can get updates!!! The web page is wonderful  inspiring  and I’m very happy to see that you’ve included there Susan’s elegant photo of Lola. Lola is doing very well today at my place. She is lying quietly but attentively near me as I write; perhaps you can feel her sending greetings. Lola seems very happy to be out of the shelter and eager to start a new life. She was obviously delighted to study the world outside the car as we drove around doing errands yesterday afternoon after I’d picked her up at the shelter  yet she didn’t bark or do anything else that might have made her enthusiasm annoying. She clearly LOVES going for brisk walks and checking out everything around her in my neighborhood and the local park. Yet at the same time she shows no sign of being surprised, confused, or worried by the sudden change in her life. It is as if she knew someone would come for her and it would be OK.
Lola is quick and eager to learn whatever I need her to know about operating procedures at my place. She loves being petted but is not in any way demanding of attention or anything else. She is showing herself to be even more intelligent, affectionate, and cooperative than we had observed her to be at the shelter. I am very glad to have her company before taking her up to Susan next week. I want to say that the staff at East Valley Shelter were just the BEST when I came to adopt Lola yesterday  so positive and helpful. This even though they were under extra stress yesterday because of dealing with pets affected by recent brush-fire evacuations. Special thanks to Dan and Irene for confirming yesterday that it would be OK to put two names and addresses on Lola’s ID chip, and that it would be OK to put Susan’s name first ,even though I was the one taking Lola from the shelter. You evidently saved me quite a bit of time, and saved Susan and me later paperwork: the customer services agent at the shelter hesitated at first when I told her what I wanted to do with the ID chip info, but when I mentioned that commissioner Irene had said it would be fine, the agent happily went ahead and put the names on as I asked. 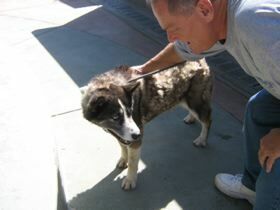 Hi Dan and Carol - I have to assume that Sami was adopted....I searched carefully several times through the internet listings and she is no longer there...I did find her a couple of days ago and she had a listing and a number. I gave the number to Carol but did not write it down myself. I checked Lola by number this evening and she has also disappeared. I guess when they are adopted they just leave the system. When I talked to Elizabeth today, she said she could not find Johnny at the shelter. 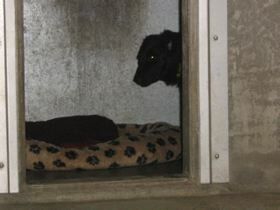 His kennel was occupied by someone else and she didn't see him anywhere. I never had his number. and Ginger..... short note but very wonderful news. Yes, HOPE, that is what we all envisioned for all the animals in the Shelter and here hope became visible! Ginger and Blossom, great news. 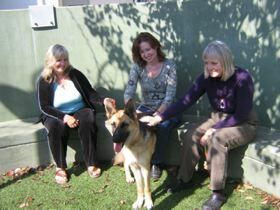 Sweet Lola must be so happy now as is Susan! Elizabeth, you really are an Angel. The web page is fabulous! Thank you and your husband for all the hard work. I've been out of town since our weekend together but you've inspired me to check up on the dogs and kitties I have been praying for. and maybe to really help. Found this quote on a dog rescue page. At that shelter on Wednesday, two women  one of them crying  were surrendering a dog together. They declined to speak to a reporter because they said they were too upset. Nearby, another man was surrendering a stray cat, explaining that someone had dumped it in an alley near his apartment on the Lower East Side. The department was doing well with adoptions until the economy went south...foreclosures, gas prices and globalization of jobs. All we can do is pray and have faith that things will get better soon.. Thank you for this article Dan. It's a reminder of how important it is for each one of us to visualize our animal friends in loving companionship with humans - we need each other! Here is an update about Lola and Elizabeth. This is a series of emails from Elisabeth, Carol and Susan  these emails are being posted because they help us appreciate the adoption process and gain more understanding of how an adopted dog ‘finds home’ with their new animal companion. I hope that others of you in our Circle who adopted animals that weekend  or since we met as a Circle  will write about your experiences. late January, mostly for the fun of it. Her health is good. The first attached photo was taken over Thanksgiving weekend, at the home of friends in Carmel Valley. Lola spent much of that weekend playing with the friends' young male dog, but for a moment I was able to catch her alone in this shot. 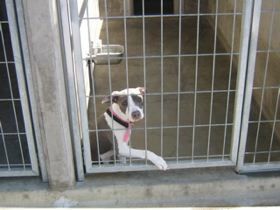 The second photo is a cropped version of the one Susan took of Lola at the East Valley Shelter. I am still shaken by the searching look of Lola's eyes in this shot. Anyway, now Lola is relaxing into her new home with me. She's also been up to the country place, but hasn't been off-leash there yet. One day soon, I hope, that'll work out. Thank you so much for updating us with Lola and you...It's so wonderful to hear how life is now unfolding and I love the pictures you sent! ***I was wondering if it would be okay with you to post your pictures and email at our animal companions webpages...the ones related to our time at the Los Angeles shelter.....it's such a beautiful story that I wish it to be shared...however, I will honor whatever are your wishes! May you have an interesting 'closing' to this year....and opening to that which is seeking us..
and her human companion DID arrive that day....it just took a while for both of them to know....for you, for Lola....when I look at her face, and her eyes, in the first photo (from your home), there's a wonderful softness there....her whole body speaks of "this is home; I am home; I KNOW home"......you can see it in her stance, her posture, the soft almost half-lidded eyes....there's no "question mark" in her body, there's no "looking outward" in her eyes and face....simply a 'Being in Place" and I find this change absolutely delightful. I don't think I am projecting (tho we always are, of course; the only question being 'how much projection" and/or 'does the projection match the reality being perceived." Thank you for your reply, and also for the more in-depth P.s. that you sent a little later in the day. Yes, Lola is home: she is becoming a consciously established presence in her new home with me. There’s a certain confidence and pride in her way of walking down the hall of our condo building with me now, which wasn’t there when she first arrived. And also there is a clear if subtle sense that she has some responsibility for security for our home. She’s obviously not a guard-dog type, yet she checks now to see that the garage door has closed behind us before we go into the rest of the building, and she always looks to see who might be in the hallway before we walk down it. I’ve encouraged her to do this, and I can see that she is pleased to have this role. It would be nice if we could also have info from others in the workshop who adopted animals from East Valley  Dee (who apparently doesn’t use e-mail) and I think there was another woman also. There is something about adopting in that situation that is different. For example, I confess to hoping that my relationship with Lola will somehow positively affect the lives of other shelter animals. I wonder how others look at it. I continue to wear and use my bead bracelet from the workshop. Its beads represent several dogs at E Valley for whom I developed particular concern during the workshop  Lola among them. Initially I prayed every day that their lives might be fulfilling, free of suffering, and happy. Now I have extended the prayer to all animals whose well-being is directly dependent upon humans, that their humans may be compassionately and respectfully aware of the sentience and particular wisdom of the beings for whom they have responsibility. This is not the first time that I have prayed for other sentient beings, but I do so more passionately now that Lola is by my side. It seems to me that whatever you can do that will cause/allow people to give time and energy to knowing companion animals on a spiritual level will be of benefit beyond its immediate scope. Have you considered a workshop for new adoptors? May this new year make us new in the places where we seek healing; and may it see us develop our special gifts fully and joyfully in service of what is most true. I took a holiday vacation from email this year, but I'm catching up today on this lovely new year weekend. I'm so very happy to see a different photo of Lola, looking so relaxed and happy at your friends house. All of our journeys together have deeply touched me and changed how I feel about our shelter experience. These wonderful dog beings are so sensitive, so amazing, so loving and so life changing and their lives so important. I'm so, so grateful you and Lola ended up together and that we're staying in touch and that she is so obviously thriving. In the way that you have found Lola changing the way you are able to pray for others, I feel she has changed me too in a similar way. I do know that she has deepened my relationship with Khyber and my heartfelt gratitude that he came to me when I so needed him. Somehow after Lola left, he blossomed, as if he finally knew that I had chosen him for his forever home. He is goofier and lovier and more emotionally expressive than ever - of course perhaps it's just in my perception of him, but I do see more deeply. 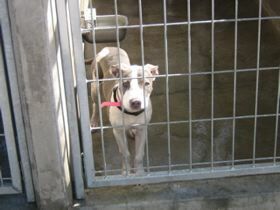 I also see how the shelter changes dogs, how much they long for the love and care of a home and how cruel humans can be. I do hope that Carol and I are able to begin working here in this area with shelters, to see if our love and prayers can help if we are able to work in an ongoing way. I do hope you'll let us know if you and Lola are back in these realms. We could even meet you on the beach in Carmel for a romp, or a walk here around the block. With much love and many hugs to you and Lola. Keep sending those photos! !